Octopuses are known as the most intelligent invertebrate. 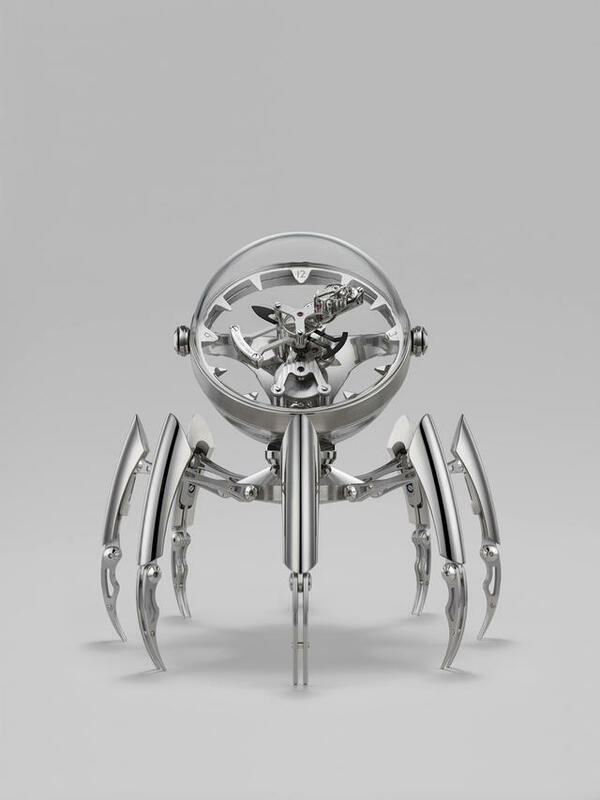 This fact clearly informed MB&F and L'Epée 1839 as they devised their latest table clock co-creation called Octopod, which displays far more sense than most timekeepers. 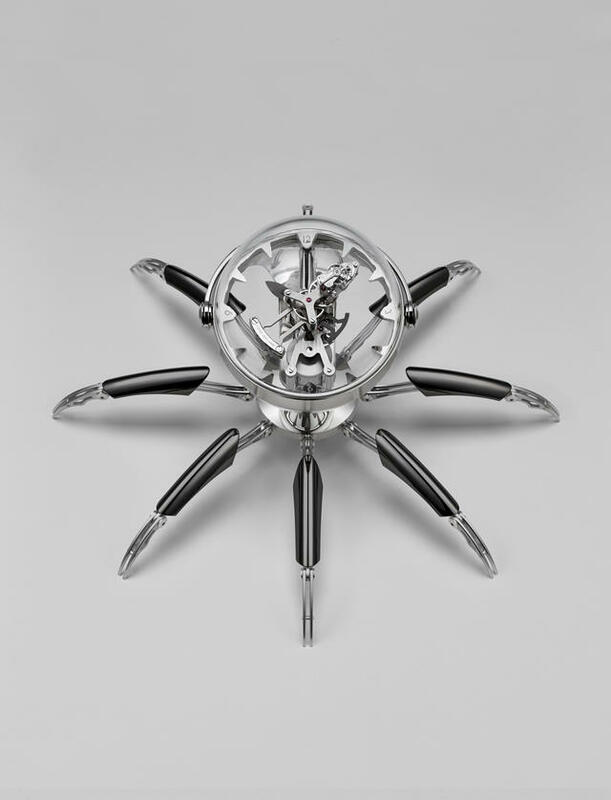 The newest example of kinetic sculpture from these two Swiss partners in whimsy features a bubbled clock head that floats above a table on eight articulated legs in a manner that recalls the firms’ Arachnophobia co-creation from 2015. But instead of that project’s domed time display, Octopod cleverly shows the hours and minutes governed by a large escapement attached to the minute hand. In other words, with its rotating escapement the new MB&F Octopod co-creation will show you a more precise reading of the time than most other table clocks. And if you imagine that the pulsating round escape wheel is the single eye of the Octopod, you’d be forgiven. Horologically speaking however, the wheel is more akin to the Octopod’s heart. 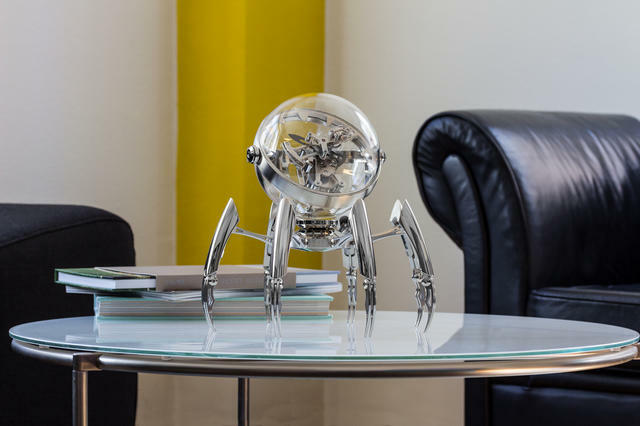 MB&F explains that while its Friends came up with the concept and design of the Octopod, it was frequent collaborator L’Epée 1839 that developed the eight-day movement, the transparent spherical case and the articulated legs. L’Epée produces, assembles and regulates the components at its Swiss headquarters. MB&F from iW Magazine on Vimeo. Another feature here that makes the Octopod particularly unusual (and sensible) is how the clock head is held in place. 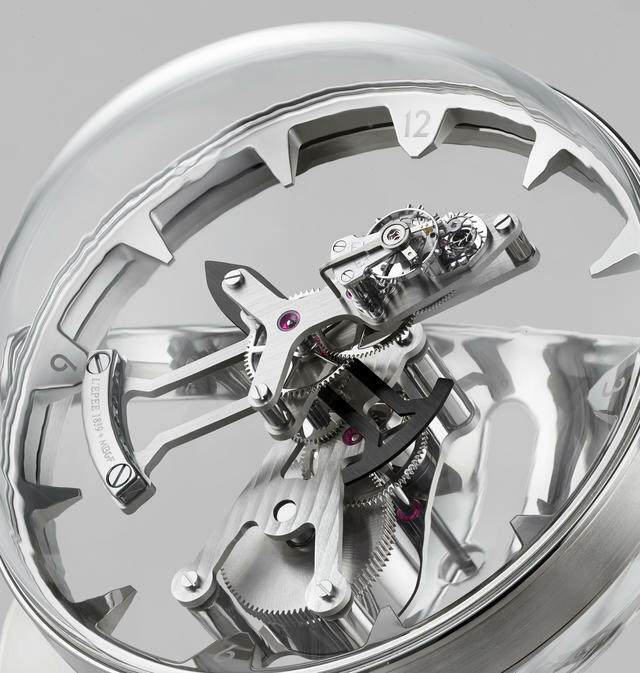 The Octopod's clear sphere sits within a gimbal, much like traditional marine chronometers. The difference here however is that the head is held on one axis rather than two, allowing the owner to rotate it as desired to better view the regulator in action. The articulated legs are also adjustable. Each leg can be locked into one of two positions, standing or extended. At MB&F, playing with your time is paramount. To maintain the illusion that the Octopod is floating in water, MB&F has treated the clock’s movement baseplate with a film of antireflective coating on both sides so that it remains almost invisible. 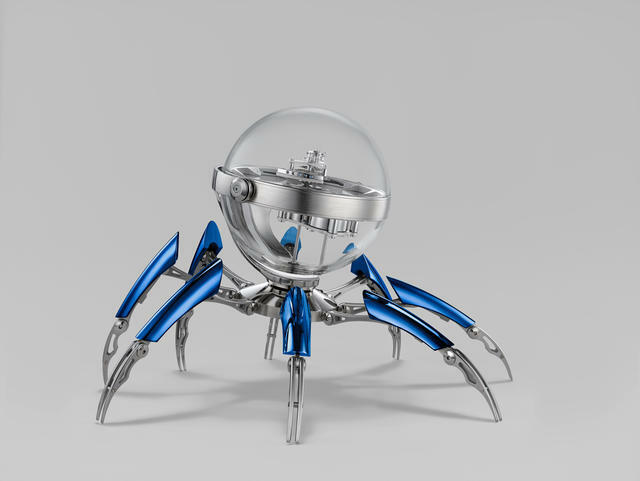 As with the HM7 Aquapod we saw earlier this year, this Octopod finds MB&F once again deep under the ocean and swimming in aquatic inspiration. We invite you to secure your goggles, dive in at take a look. The MB&F Octopod is available in three limited editions of 50 pieces each in black PVD, blue PVD, and palladium (silver). Price: 35,000 Swiss francs, about $36,400. 360° rotation in both vertical and horizontal planes with 3 sandblasted and satin-finished brass rings.